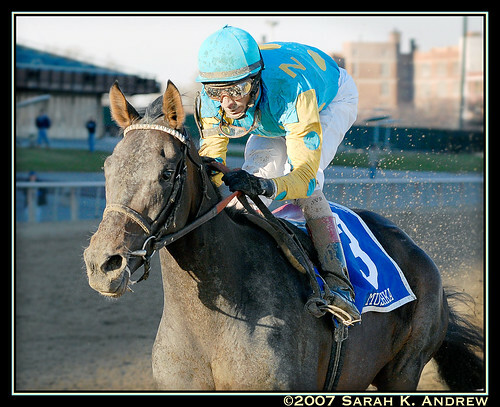 This daughter of Empire Maker scored her dirt and turf graded wins as a 2yo in the G2 Demoiselle (2007) on dirt and G3 Glenn Falls Handicap (2007) on turf. She successfully branched out to synthetics as 4yo in 2009. She won the G1 Spinster at Keeneland by DQ but followed up with a game and surprising second in the 2009 Ladies Classic at Santa Anita on synthetics. Videos for the Demoiselle and Glenn Falls Handicap are not currently available.